When you spend all day sitting, the aches and pains can build up over time and lead to issues. 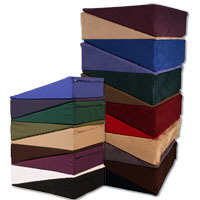 With our suede Rebond foam chair pad at the ready, remedy this concern with a comfortable and supportive solution. Since it provides ultra-firm support with the comfort of a fiberfill cushioning layer, a Rebond foam chair pad with fiberfill is a great solution for those individuals who spend a majority of the day sitting such as office workers. It is also ideal for use in automobiles and trucks since the foam is comfortable enough to endure hours of repeated use without being affected by motor engine vibrations. Also, the relative thinness of the design ensures users never feel like they are sitting on a booster seat which is ideal for driving when you have limited headroom. Featuring a 7LB density, this reliable cushion provides the support of much larger foam pads in a lower-profile form which only adds to its overall value. And with the added Dacron fiberfill wrapping, this pad's comfort layer is soft to the touch. The cover is a soft and enjoyable suede which ensures an option that is stylish enough to pull out without any shame while also offering an added layer of softness for your needs. With our suede Rebond foam chair pad at the ready, experience a world of comfort and relief for those who spend hours at a time sitting. If you have any questions about this solution, please Contact Us for assistance on the matter. Our team is happy to help!